The 1st in our series of webinars on issues facing fleet management and the fuels market in the UK today. Allstar has worked with many thousands of customers -and suppliers- over the past 30 years, developing our products to provide innovative payment solutions for fuel. This focus has given us an unparalleled knowledge of the fuel landscape: knowledge you could be using in your own business. Join our Chief Operating Officer, Paul Holland, for the first in our series of webinars, as he shares the insight gained from working with businesses such as yours. 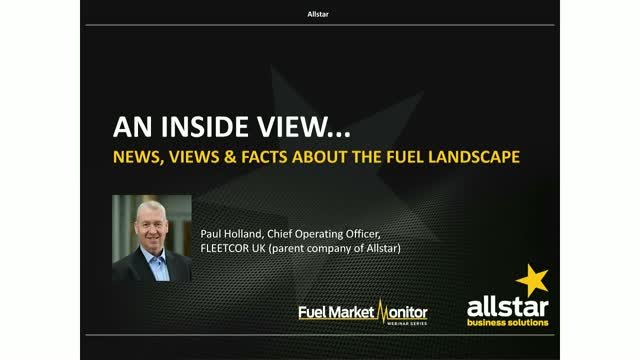 Over the past 25 years, Paul has seen how both fleet management and fuel pricing has changed through many periods of uncertainty and will be sharing his knowledge with you during this webinar. 1. The facts on oil-pricing, external influencing factors and future price predictions. 2. How changing landscapes, such as Brexit, could impact fuel, whether in terms of supply or cost especially with exchange rates uncertainty. 3. The potential future challenges facing fleet and fuel that we’ve identified – and the solutions. An Inside View… news, views and facts about the fuel landscape – with a special focus on alternative fuels. - An update on global fuel pricing and what’s been driving change. - A brief update on the UK fuel market including our observations on the impact of Brexit. - The evolution of the changing fuel market and how we think this may be impacted over the next few years with the introduction of alternative fuels. While we don’t have a crystal ball, we do have decades of experience of the fuel market to draw on. Our fuel cards enable over 50,000 UK businesses to keep their 1.5 million drivers on the road: making deliveries, taking orders, meeting clients and colleagues, giving presentations, and all the other activities that are essential to the success of every business. Every time one of our fuel cards is used, it gives our customers valuable information about each journey. And it gives us information that is unattainable elsewhere about fleets and fuel prices, outside influencing factors, journeys and driver behaviour. In short, it helps us to know the fuel market inside out. This focus has given us an unparalleled knowledge, which you could be using in your own business. Join Our Chief Operating Officer, Paul Holland, and Nick Webb, our VP of Product and Marketing, as they share with you the insight gained from working with businesses such as yours.